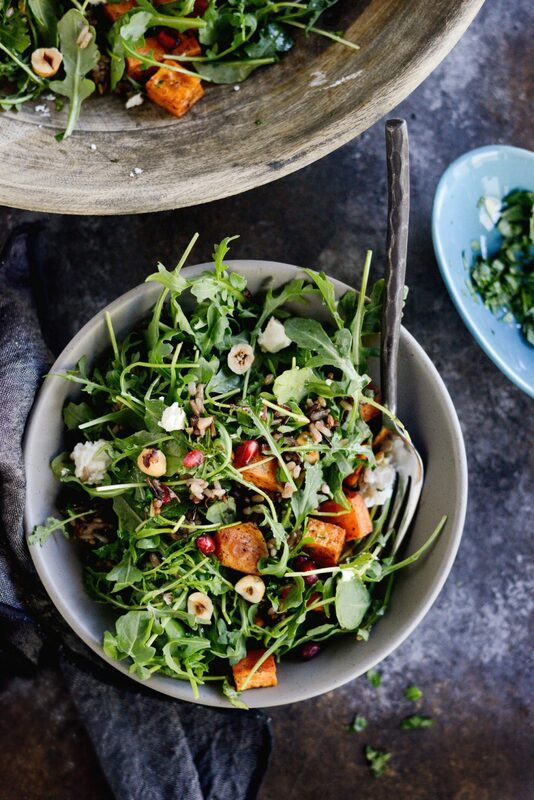 This Sweet Potato Wild Rice Arugula Salad is so hearty and filling! 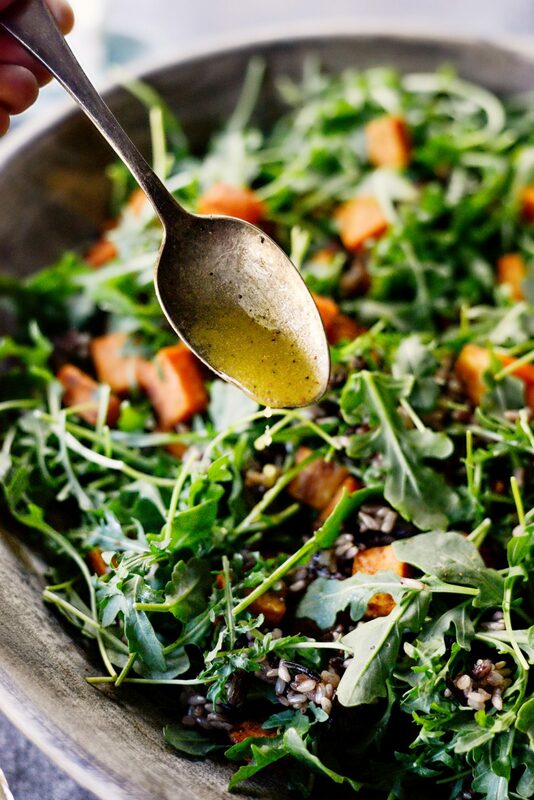 Baby arugula is tossed with diced roasted sweet potatoes, cooked wild rice and fresh herbs. 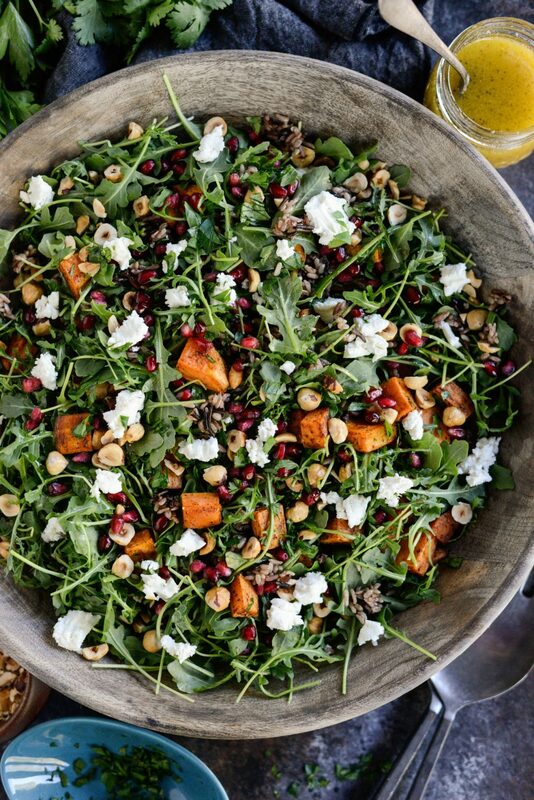 It then gets drizzled with a lemony, maple dijon dressing and sprinkled with pomegranate arils, chopped toasted hazelnuts and crumbles of goat cheese. 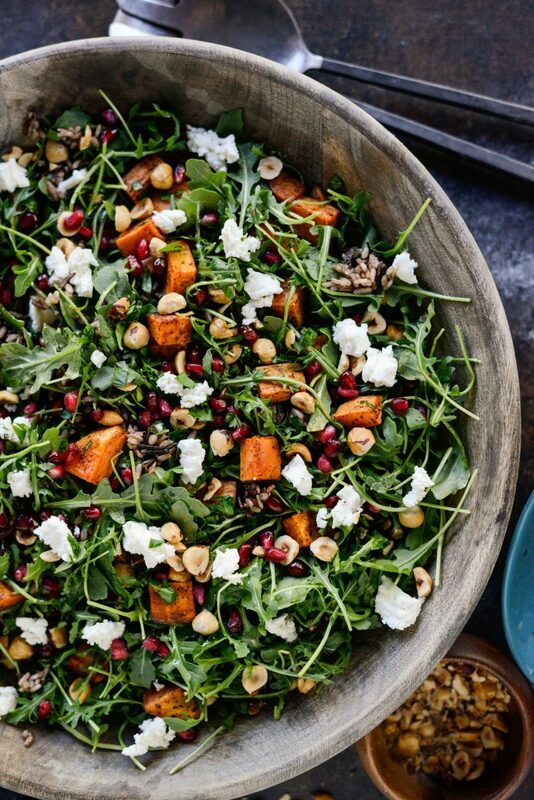 Fall in a bowl pretty much sums up this gorgeous, nutritious and delicious salad. I hope you don’t mind, but I’ve got another salad to share with you today. This one is a little bit more fall-ish than the last, so I’m thinking you are really going to love it. 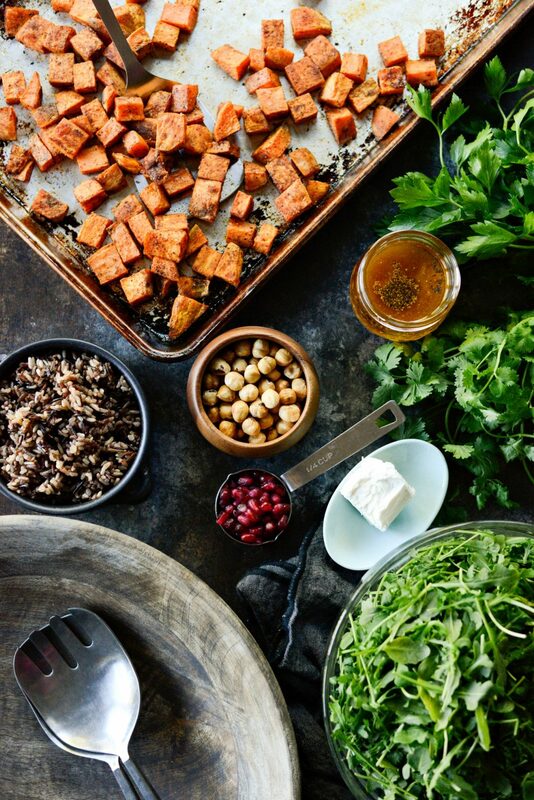 Roasted sweet potatoes, toasted hazelnuts, goat cheese! Pat was up north last weekend, and the girls and I caught up on a few past episodes of This Is Us, did a little shopping– really just spending some much needed quality time together. One of the nights I made us salmon and wild rice, which is usually our go-to meal whenever Pat’s up north. The reason why I make it just for us girls, is because as much as he wishes and gives salmon an honest try, Pat just can’t bring himself to like it. I usually use this broiled salmon recipe and just make the wild rice in my rice cooker. Since Malloree refuses to love rice (<—whyyyy?) I had some left over, so I saved it and decided to throw into a salad with a few other ingredients that I had laying around. Yes, rice in salads is totally a thing and a great way to use up leftover and to bulk up a salad when you don’t have a lot of add-ins. Plus texturally, it adds a little something-something to a salad. 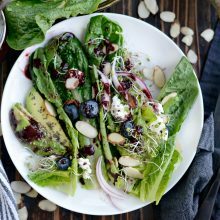 So this beauty is one of my latest and greatest salad adventures. And I’m in love. 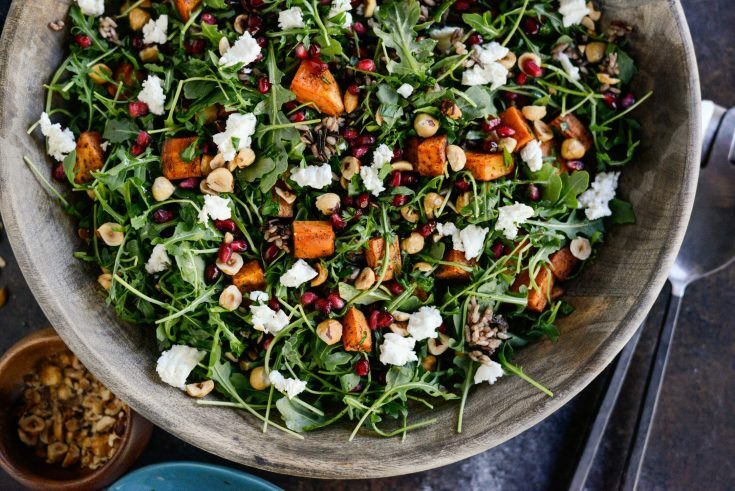 This roasted sweet potatoes wild rice arugula salad is topped with pomegranate seeds, chopped toasted hazel nuts and goat cheese. <— a flavor combo that is utterly out of this world GOOD! 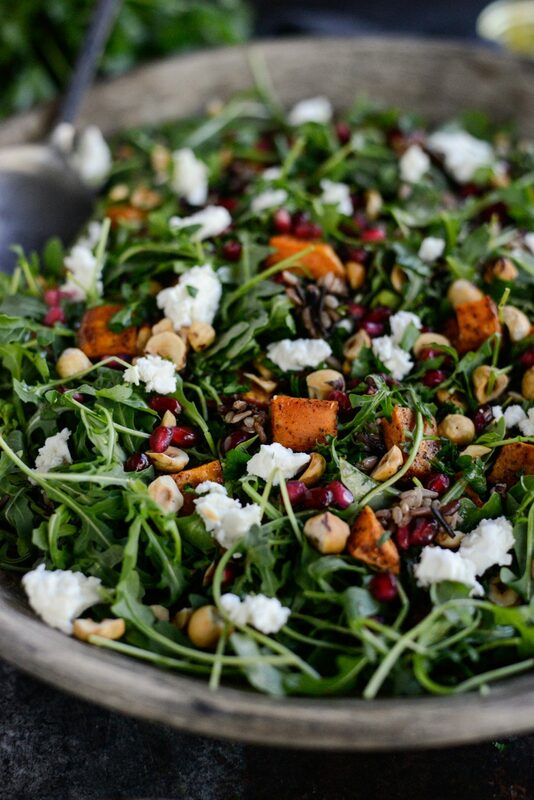 For this salad you are going to need 5 ounces baby arugula, roasted sweet potatoes, cooked wild rice, toasted hazelnuts, pomegranate seeds, fresh herbs and goat cheese. Oh! And a maple dijon dressing. For the sweet potatoes, peel and dice into 3/4-inch (ish) pieces. Drizzle with olive oil and sprinkle with chili powder, cinnamon, garlic powder, onion powder and smoked paprika. 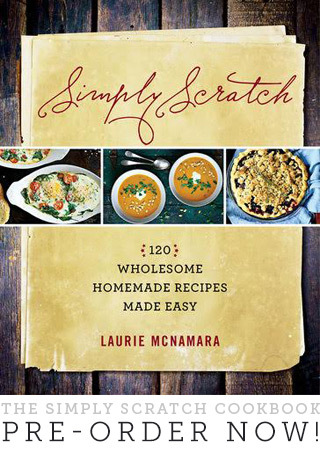 No measurements, just sprinkle and toss with your impeccably clean hands. 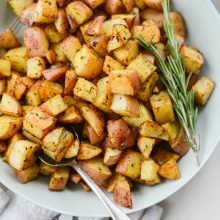 Slide the pan into your preheated 400° oven and roast for 20 to 25 minutes or until fork tender. 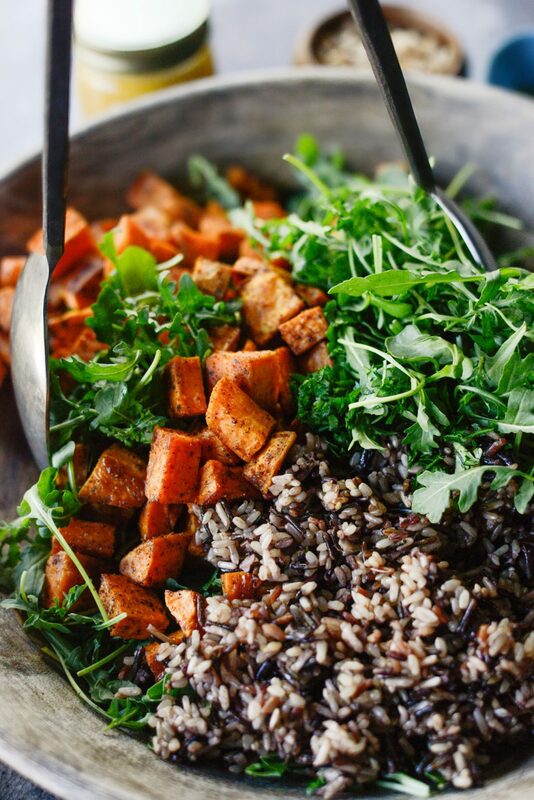 In your serving bowl, add the 5 ounces of arugula, 1 cup of the leftover wild rice, roasted sweet potato and minced fresh herbs [1 tablespoon minced fresh parsley and 1 tablespoon minced fresh cilantro]. 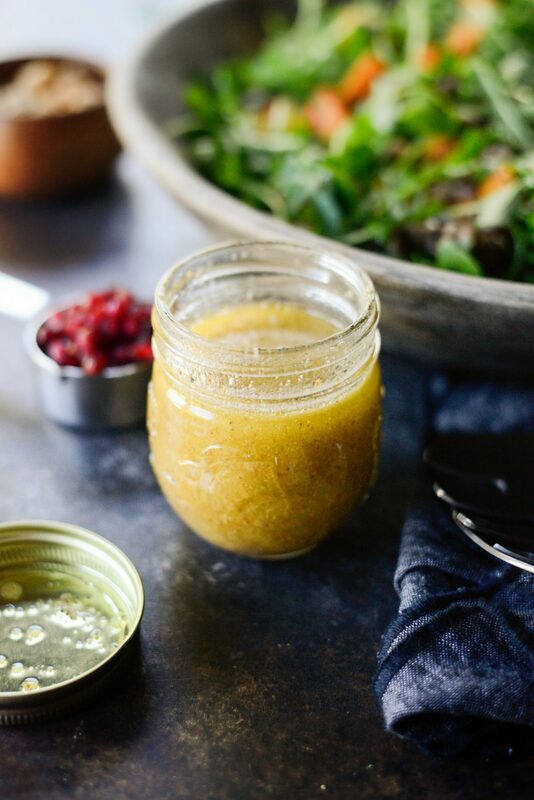 The dressing is simple: 1-1/2 teaspoons of dijon, 1 tablespoon pure maple syrup, 2 tablespoons lemon juice, 2 tablespoons pomegranate vinegar (or use red wine vinegar), salt, pepper and 1/2 cup of olive oil. If ever a dressing tastes too vinegary, just add a few splashes of water to cut it. Next, drizzle with spoonfuls of the dressing and gently toss to combine. Finally sprinkling with the chopped toasted hazelnuts, pomegranate arils and crumbles of goat cheese. 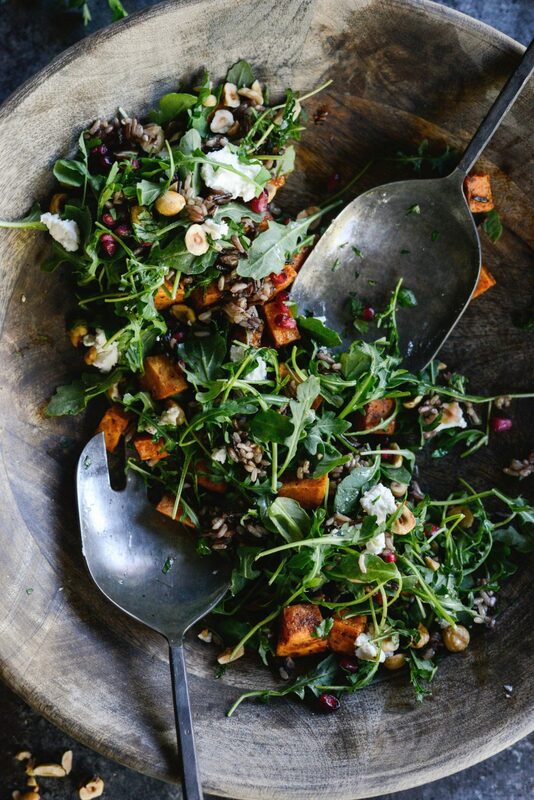 I lost my mind over this sweet potato wild rice arugula salad. 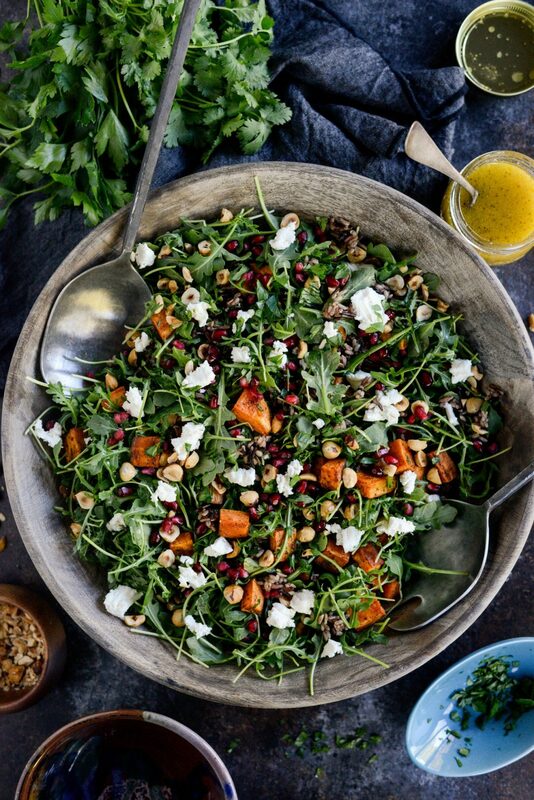 So many flavors that are utterly scrumptious; goat cheese, sweet potatoes and hazelnuts with the peppery arugula, tart pom seeds and hearty wild rice is everything. Enjoy! 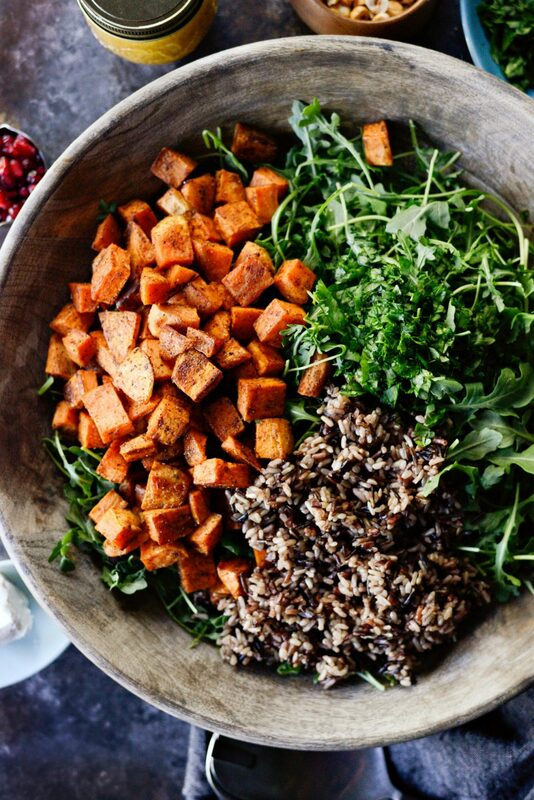 And if you give this Sweet Potato Wild Rice Arugula Salad recipe a try, let me know! Snap a photo and tag me on twitter or instagram! Preheat your oven to 400°. 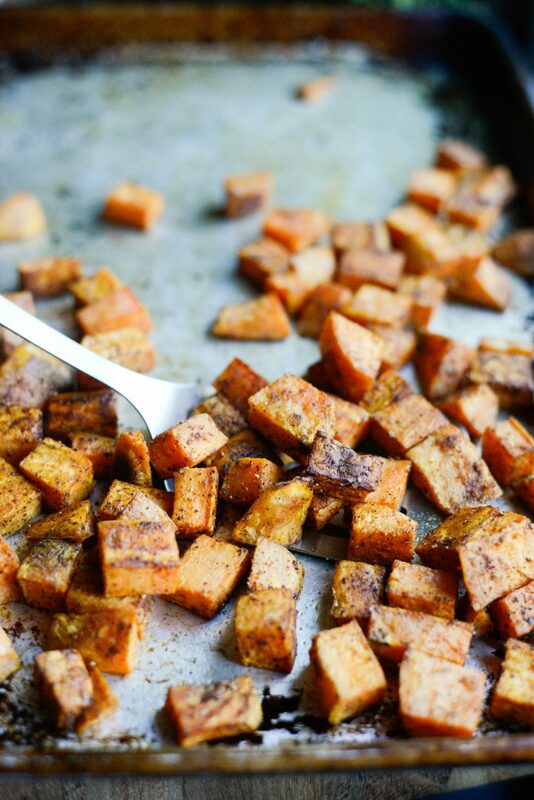 Place diced sweet potato onto a metal, rimmed sheet pan. 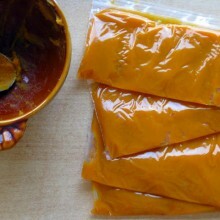 Drizzle with olive oil (about 1-1/2 tablespoons, more or less as needed) and sprinkle with chili powder, cinnamon, garlic powder, onion powder and smoked paprika. 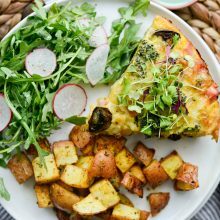 Toss to coat and spread evenly on the pan, then slide the pan onto the middle rack of your preheated oven and roast for 20 to 25 minutes, or until fork tender. Remove and let cool. 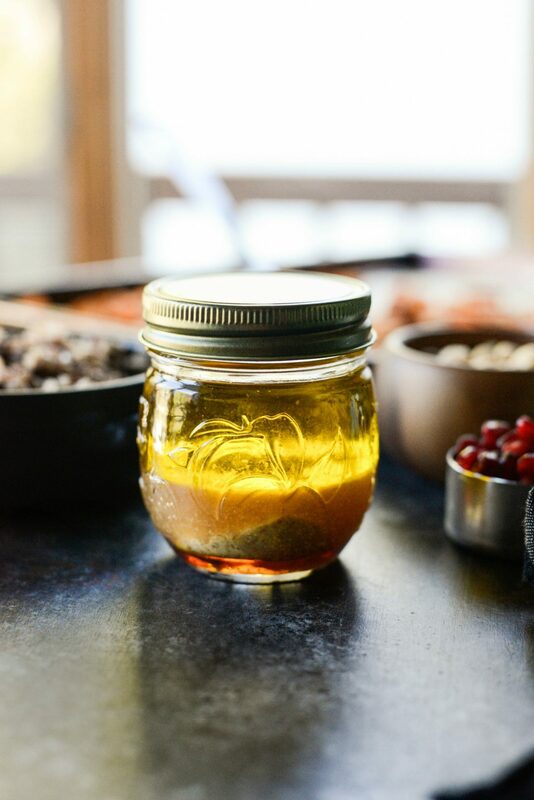 In a small jar or container, that comes with a tight-fitting lid, measure and add in Dijon, maple syrup, lemon juice, pomegranate vinegar, olive oil, salt and pepper. Secure the lid and shake well to combine. 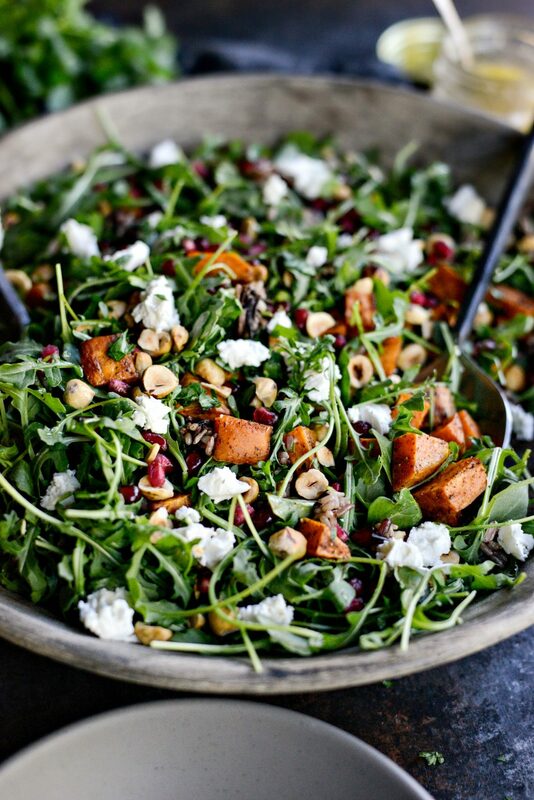 In a large salad or serving bowl, toss together the arugula, sweet potatoes, wild rice and chopped herbs. Drizzle with the dressing and gently toss to combine. Sprinkle with the pomegranate seeds, hazelnuts and crumbled goat cheese, then serve. 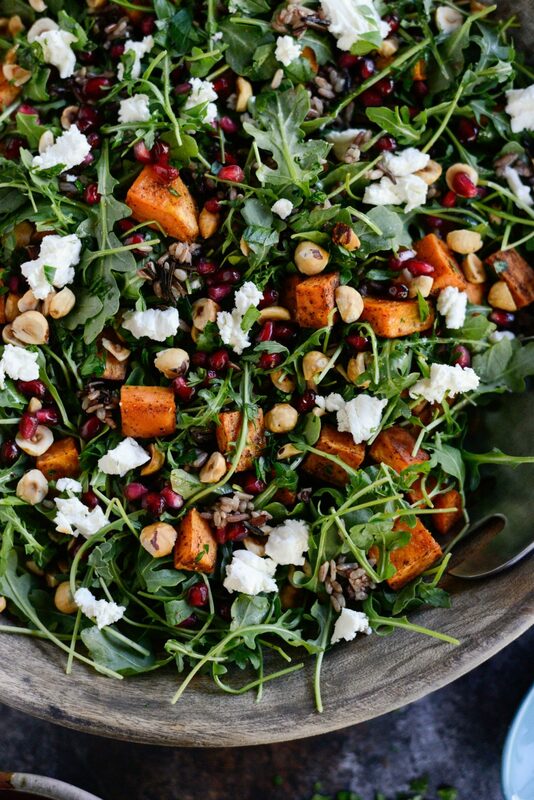 This sweet potato arugula salad looks amazing. 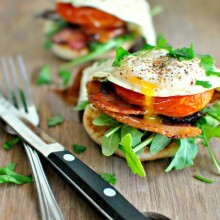 I like every single ingredient. 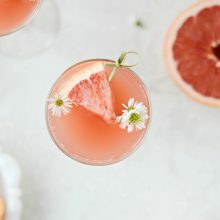 I’m definitely going to make this while I’m working on integer computers. Adding goat cheese to salad is my favorite!